Tattoo Blog » Meet Yoni Zilber! Tattoo Blog » Pictures » Meet Yoni Zilber! To me, hearing a tattoo artist speak about their work efforts in such terms as beauty, flow and simplicity is a surefire sign that the artist in question is a dedicated one. Not only that, but there is a modesty in such a declaration, a reassuring subtext that promises the best of the ability that the artist has to offer. I like that. I like that a lot. Yoni Zilber began his tattoo career in his home land of Israel. Tel Aviv, to be more precise, in 1998. Since that time, he has travelled around the world, tattooing his way through various locations in Europe, Asia and America. He currently works at Brooklyn Adorned in Brooklyn, New York. …[ I ] studied tirelessly on my own, but without a mentor I could only go so far. As of 2007, Zilber has been studying Tibetan art under the tutelage of Tibetan Tangka painter, Pema Rinzin. Being able to translate Tibetan art into the form of tattoo art is a challenge for Zilber, but one that his work thus far proves him capable of handling. 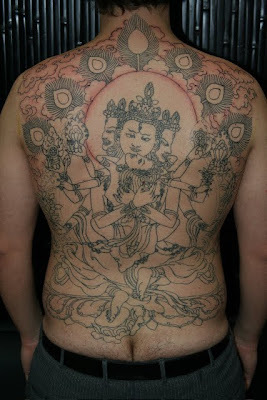 Zilber isn’t lying when he says that he is one of the few tattoo artists working who specializes in the Tibetan style. This brings a great wealth of originality and beauty to his work, not to mention affording the Tibetan art a chance to be seen and appreciated by many more people. Check out some of Yoni Zilber’s beautiful work.